Arthur Conan Doyle was born in Edinburgh and was sent to the Jesuit Prepatory School in Stonyhurst in 1868. He continued his education at Stonyhurst College and from 1876 to 1881 he studied medicine in Edinburgh. During his studies he started writing short stories and "The Mystery of the Sasassa Valley" was published in 1879. He sailed on the SS Mayumba to West Africa as a ship's doctor before he finished his doctorate in 1885. After a luckless attempt to start a practice with his friend George Budd in Plymouth, he started a medical practice in Portsmouth in 1882 at 1 Bush Villas in Elm Grove, Southsea. He hadn't many patients and during his spare time he wrote "A Study in Scarlet", the first Sherlock Holmes story. It was publushed in 1887. He based Holmes on Joseph Bell, a professor at Edinburgh who used logical deduction. From 1891 onwards Sherlock Holmes stories were published in the Strand Magazine. In Southsea he was the goalkeeper of the Portsmouth Association Football Club, the future Portsmouth FC. Between 1899 and 1907 he also played cricket on a high level. Apart from that he was an entohusiastic golfer and amateur boxer. In 1885 he married Louise Hawkins, the sister of a patient of his, John Hawkins. In 1889 they had a daughter, Marie Louise, followed by a son in 1892, Kingsley. In 1893 Doyle joined the Society for Psychical Research and spiritualism would play an increasingly important part in his further life. In 1890 he had studied the eye and he started his own pratice as an ophthalmologist in London in 1891. He stated later that he didn't have a single patient and he dedicated most of his tiome to writing. His Sherlock Holmes stories were very popular, but Doyle as bored with his hero and killed him at the Reichenbach Falls in Switzerland in order to be able to turn his attention to his historical novels. In 1894 he lectured in the USA and in 1895 he visited Egypt. In 1900 he served in the Boer War. In 1902 he was knighted. He believed this was because of a pamphlet he had written on the Boer War in which he justified the role of the United Kingdom. On that occasion he met Oliver Lodge, who was knighted on the same day. They started a correspondence on the subject of spiritualism. Doyle met Jean Leckie on 15 Mar 1897 and it was love on first sight for both of them. But Doyle felt he couldn't betray Louise, who was already suffering from tuberculosis at that time, and he and Jean decided that their love should be platonic. Doyle's mother knew all about it and even comforted Jean. Louise died in 1906 and Doyle was saddened by her death and felt guilty about his love for Jean. He suffered from a depression, but in 1907 he married Jean and theirs was a very happy marriage that lasted until his death. With Jean he had three further children. Denis was born in 1909, Adrian in 1910 and Jean in 1912. After killing Holmes, Doyle had discovered that the golden age of the historical novel in the tradition of Sir Walter Scott was over. The public didn't agree with him that they were his best work and only wanted more Holmes. Slowly he gave in. In 1901 "The Hound of the Baskervilles" with Holmes as the main character was published but Doyle made clear that the story took place before the Reichenbach Falls. The public acclaim was enormous and in "The Adventure of the Empty House" Holmes returned and explained that his death had been faked. In 1912 he published "The Lost World", a novel about an expedition to an area in South America where prehistoric creatures still lived. The main character was professor Challenger, who returned in other fantasy stories by Doyle. In 1918 Doyle's son Kingsley died of pneumonia in Belgium after he had been seriously wounded at the BAttle of the Somme in 1916. Doyle tried to contact his son's soul and he fell deeper and deeper under the spell of spiritualism. The death of his brother Innes Doyle (also of pneumonia) and his brother in law E.W. Hornung (in 1921) probably intensified his attempts to contact the death. In 1918 he published "A New Revelation", a book on spiritualism. In 1920 he sailed for Australia to promote spiritualism by means of public readings. In 1922 he continued his readings in the USA and there he continued a curious friendship with Harry Houdini, whom he had met in 1920. Houdini also studied spiritualism, but as a sceptic. Houdini had an enormous library and Doyle read the letters by D.D. Home and Ira Davenport that were in Houdini's possession. Things went wrong after a seance in 1922 in which Doyle believed that the spirit of Houdini's mother had been contacted by automatic writing with Jean as the medium. Houdini was there. In 1924 he started ridiculing his friend publicly and Doyle wrote to him bitterly that he had said quite different things at the home of the Doyles. In 1925 Houdini called Doyle a 'menace to mankind' in Symphathy Hall in Boston. But many people in the public agreed that Doyle might be mistaken and foolish to believe in several obvious frauds (like some pictures of fairies) but they believed that his intentions were good and he certainly didn't deserve such a treatment by a former friend. One person from the audience called: "I know one thing you can't do, Houdini, that Conan Doyle could!" An angry Houdini asked what this was and the man answered "Fill this hall twice!". Doyle had spoken before on spiritualism in the same hall. Houdini and Doyle didn't meet again until Houdini suddenly died in 1926. Doyle devoted the rest of his life to spiritualism, allthough in 1927 a last volume of Sherlock Holmes volumes appeared. In 1925 Doyle opened a Psychic Bookshop in Victoria Street, London and in 1926 he spoke to 5,000 people in the Royal Albert Hall. "The Edge of The Unknown" was published in 1930 and it was his last book. 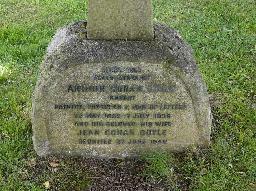 All his travelling had worn him out and in 1930 he died at home from heart failure. Everybody who had known him was convinced that a man with a very good heart was gone and a special train transported all the flowers on the day of his funeral. He was buried in the garden of his house Windlesham in Crowborough, Sussex. 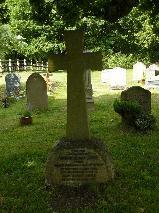 When Jean died in 1940 she was buried beside him. In 1955 the house was sold and their remains were transferred to Minstead, Hampshire in the New Forest. A simple gravestone was erected in a far corner of the cemetery because they hadn't been Christians. 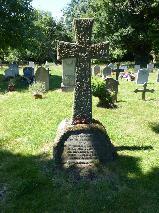 The grave of Sir Arthur Conan Doyle at All Saints' Churchyard, Minstead.